On the April day when Joseph Dennis’s excellent piece on the 1987 Buick Skyhawk coupe appeared, I read it, walked to lunch, and immediately came upon this Skyhawk sedan. Bam! That’s some powerful CC effect there. I think this is an early Skyhawk. I knew that the J-car Skyhawks had several front-end treatments and I figured the one on the car I found would narrow down its model year (when I got around to researching it). Turns out Buick used the various front ends fairly indiscriminately over the car’s seven-year run. Those tail lights mark this as an early car, I think. Maybe. I know some of the later Skyhawks’ tail lights had a bright strip down the middle, at least on some trim levels. It’s all so confusing. And it’s not like there’s a Skyhawk enthusiast Web site that charts all the changes. But who cares? That this thing survives intact, complete, and with only minor rust is pretty darned remarkable. Given that every trim detail is intact, and the car is virtually blemish free, you can sense it has likely never been abused. A very fortunate Skyhawk, as the J-cars never were considered not fragile. I have not seen one in years. You are correct that is an early model (1982-1985-ish). My mom had an 88 two door (not hatchback) with the hidden headlights. I was thinking the same thing – wow, a Skyhawk! 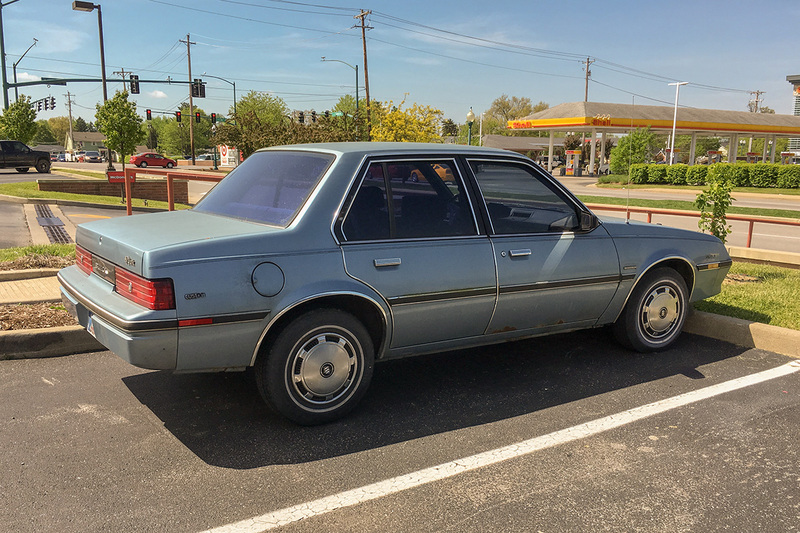 I still occasionally see the Cavalier version, rarely a Sunbird, and despite their lower production numbers the Cimarron seems to have a surprisingly high survival rate. But it’s probably been 15 years since I’ve seen a Buick or Oldsmobile J-car. I always wondered who was the typical buyer of the Skyhawk and the Firenza. Doesn’t seem like it was the typical Buick or Oldsmobile customer. They were older people who wanted a small car or young people who wanted a Buick. I knew one of each. Did you notice the license plate? Circa 1989 I had one neighbor with a blue Skyhawk and another with a silver Firenza in the same building! but NOT ONE Cavalier or Sunfire! So in a certain part of Pittsburgh’s East End there was some love for middle range J cars! My father had one of these (a 2-door T-Type, though not the turbo) from new until 1996. Served him well for 264,000 miles! The feature car is from 1984 or 1985; earlier cars did not have the vertical slats in the bumper air intake, and this one is missing the CHMSL found on the 1986 models. I had a choice of this( in a dusky rose color instead of this light blue), or the blue fastback J2000 that I did wind up buying, back in 82 when I foolishly thought I wanted a J-car. My boss’s friend wound up buying a twin to this a month later. His had the OHC engine, so I would think this is a very early car, as there are no OHC badges showing. There’s another CC of an early Skyhawk with some good-looking bucket seats (made by Lear, I think) and it makes me wonder, does anyone know how well the J-body Skyhawk sold, particularly in relation to its Oldsmobile sibling, the Firenza? In another “What might have been”, it would have been interesting if the ill-fated Cadillac Cimarron hadn’t been built and, instead, the features that had differentiated it from the more plebeian J-bodies had been utilized on the Skyhawk. IOW, would things have turned out better if there had been a more reasonably priced, Cimarron-like package available on the Buick Skyhawk? The idea of a really expensive J-body was a bad one (particularly one that looked so much like a Cavalier) but anecdotal evidence suggests the car itself wasn’t so bad. I had an 83 similar to the top picture, but cream color. I also had alloy wheels with the firmer ride and handling suspension. The engine was the OHC with 5 speed manual, and automatic climate control. The car was not bad, but there were vibrations at certain speeds. The Cimarron sold 130,000 by the end of its run. Skyhawk annual sales were in the 50,000 to 100,000 range during the mid 80’s with total sales nearly 500,000. Don’t have a number for the Firenza. While the Cimarron was likely quite profitable (at least in the short-term), I wonder how many more Skyhawks they might have sold if they had been equipped like a Cimarron, not to mention not damaging the Cadillac image for years to come. The potential higher volume of Cimarron-Skyhawks might have been ultimately more profitable, as well. 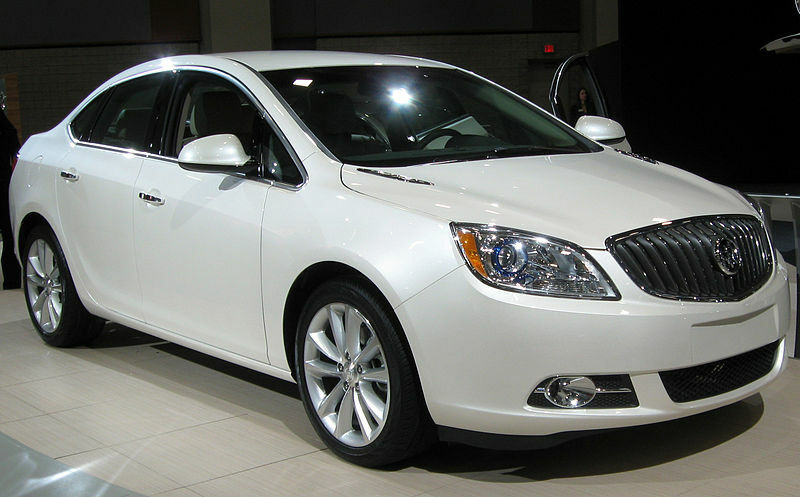 Upscale consumers might have more readily accepted a more luxurious Buick J-body, and at greater numbers, too. 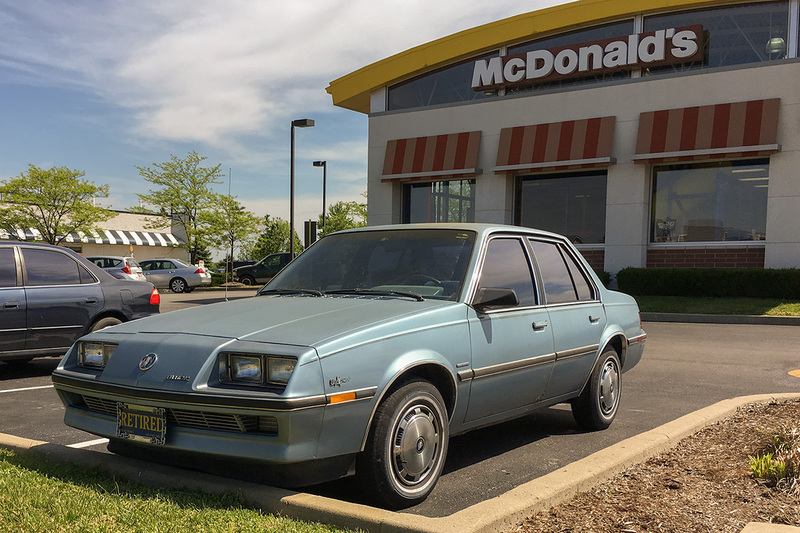 The Cimarron had a leather seat interior package, but otherwise was basically the Cavalier, with a suspension/tire upgrade. The Skyhawk did offer the suspension upgrade (more or less), but not the leather seats. The Skyhawk also had automatic climate control, which was offered for a limited period, and not available on other J-cars. Exactly when Cadillac decided that a small car was needed is not clear, but they should have downsized the first generation Seville to a smaller size for the 81 or 82 model year instead of moving it to the E-platform keeping the same size. I have always thought the Cimmaron wouldn’t be “laughed at” had it been sold as a Buick​ or even as an Oldsmobile. The late Cimmaron wasn’t a “bad” car, It was just not a Cadillac. These early Js had nice lines and pretty clean styling. Always liked them better than the later versions. On paper they seemed to have it all together, but in practice it was the usual GM cost cutting, poor engineering and haphazard assembly. Pity, because like the X-cars before them, they had so much promise. I think the front license plate says it all: “RETIRED”. Must be owned by someone who is the responsible type. Also, TBI was introduced in ’83 or ’84 which gave the engine a second wind and made ownership less of a headache and that’s why it has lasted so long. Once its handed off to a teenage grandson, I doubt it will survive more than a year or two. That seems to be a common sorry. 20 year old survivor car in meticulous condition handed off to teenage grandson, after which it is destroyed in 1-2 years. These cars were prone to rusting very quickly here in the Northeast, yet I still feel they were durable little cars that got ‘used up’ quickly and were simply forgotten about. The Buick and Oldsmobile versions were certainly the least common of the J- car offerings, and I remember when I did see one it was surprising in comparison to the popular Chevy and Pontiac versions. I honestly think they were better cars than we have made them out to be, considering it was the 80’s when they were introduced. GM was always better at building large, gas-eating V-8’s – yet these little 4 banger engines would easily hit 200k miles if properly taken care of. I think part of the problem was the clientele that bought them new. Possibly, the majority of owners didn’t exactly care for their cars as they should have. When you add in the horrible rusting issue then it makes them seem far worse than they may have actually been (or could have been). My brother in law/sister (living in the Northeast at that time) bought a 1984 Pontiac J2000, and I think based on that my parents (living in the Southwest) also bought a 1984 J2000…which one do you think lasted the longest? Well, my parent’s car started out losing a timing belt with probably less than 500 miles on it, and went through 2 engines in less than 80k miles (and it was maintained per the mfg spec at the local dealer). First engine was replaced by GM, 2nd engine threw a rod and the car was junked ….it had other issues, like leaking power steering hoses, light switch came apart…in less than 5 years. I’m sure my Father would say that this was the worst car they ever owned. My Sister/Brother in law’s car lasted quite a bit longer, rust got to it and it died a “normal” death for a car in the Northeast. I think it is the only new car my brother in law has ever bought (he’s well into double digit cars owned, I’m still on number 5, as I keep my cars a long time, have only bought one of those cars new). If i remember correctly, certain years of these cars had the Buick letters glued individually on the back panel – they would invariable lose letters. The only reason i remember these cars at all it that i would always joke about the “_ui_k” (prounounced yew-icks.) There were enough of them around here in PA that I remember that little fact. I want to say some of the Centuries of the time had the same styling affectation- a center backup light with individual letters, and yes, invariably they’d be BU CKs or UICs or ICKs. The last Skyhawk I saw was a facelift wagon version with the flip lights, don’t remember exactly how long ago I saw it, but I’d say it’s been almost 10 years. I hadn’t saw these Skyhawks (and Firenza) in ages! Looking through oldcarbrochures.com, it seems the rounded front came in for ’87 and was offered in both hidden and open headlight versions. I had thought sure you were missing one in between, but no. Pontiac and Olds lightly refined their J-car noses for ’84 to round off the square-chinned spoiler (while Chevy did a heavier facelift that went from single to quad headlights), but Buick didn’t change anything. Not true; 1984 Skyhawks came with a modified intake grill that lasted thru 1986. The look is very similar to the 1982-1983 front, but these later models include several vertical slats set equally across the width, and do not have the horizontal lines that overlap the turn signals set within the corners of the lower bumper in the earlier front. It may just be me but the front end of those first J-body Skyhawks sure remind me of the first generation Saturn SL cars. 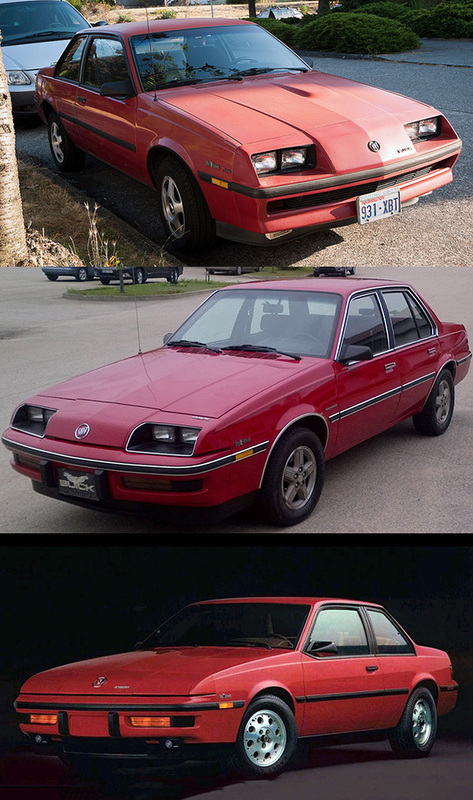 The early Firenza was even more Saturnesque than the Skyhawk – the Saturn SL1 always reminded me of the ’82 Firenza. It has the same platform as a Cruze but more specifically it is a sedan version of the Opel/Vauxhall Astra. Cavalier mk2/Opel Ascona; the Astra was smaller still. Those old J cars were horrible, horrible automobiles. Absolute junk. I know this from firsthand experience. It was from owning a 1984 Skyhawk that was a migraine of an ownership experience. I never considered owning an import prior to my Skyhawk, but after a test drive in the newly designed 1986 Honda Accord I was hooked on imports for life.